WILLEMSTAD - The cargo port of Curaçao is very outdated. 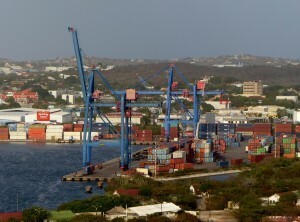 The island relies on facilities that leave much to be desired, leaving the number of containers handled per hour (compared to the other Caribbean islands within the Kingdom of the Netherlands). According to experts, therefore, urgent investments are needed. In addition, more competition should shake up Curaçao Port Services - the company responsible for loading and unloading ships. For an island such as Curaçao, a port is of great importance. A lot of food is not produced on the island itself but imported by plane or by boat. Air transport is relatively expensive and is often used for specific high-quality products with a limited shelf life. That is why most products are transported by boat to the cargo port. However, research by Ecorys, commissioned by the Ministry of Economic Affairs, shows that the port of Curaçao is quite outdated. One of the conclusions from the report - 'Research on prices in the Caribbean Netherlands' - is that food prices in the Caribbean Netherlands have risen sharply. As port costs also affect the prices that consumers have to pay in shops, the port of Curaçao was also examined. As part of an ongoing investigation at the Ministry of Economic Development (MEO) of Curaçao, the consultancy firm already conducted interviews in 2017 about the progress of the port. The researchers looked at the number of container movements and specifically at the number of containers handled per hour. A container movement is the movement of a container from the terminal container to an inland vessel or bin (loading) or vice versa (unloading), to which costs are connected. For example, the results show that the number of container movements in the port of Curaçao per hour is relatively low. In comparison with Sint Maarten, where 17 to 18 container movements take place per hour, Curaçao continues to stab 12 to 14 container movements per hour. Aruba is even good for 22 to 23 container movements per hour with little wind. In bad weather, however, that island has to do with 15 to 16 container movements per hour. Nevertheless, that is still more than the average number of container movements per hour on Curaçao. Furthermore, the investigation shows that the container port does not work with tight schedules. The port activities are based on the principle of 'first-in, first-out', so there are no specific times for ships to enter. From a financial point of view this brings uncertainty, because ships cause higher costs due to delays because, for example, the value of products, such as shelf life, is affected. The position as a reliable transit port is therefore not confirmed. In addition, according to the respondents, there are few undercarriages with which containers can be transported, which also creates a traffic jam here. Containers must be checked by customs, which is usually done within three to four days of arrival. Nevertheless, the investigation shows that containers are only regularly released by customs after six or seven days. According to the respondents, that is far too long. Moreover, they indicate that not only the waiting time is longer than planned, but that the costs per container are also higher. Normally the handling of a container costs about $ 1000, but according to the interviewees it is a minimum amount. Money is often asked for unforeseen and hidden costs. This also does not give the port of Curaçao a good reputation as a transit port. During the interviews, a number of proposals were also made to solve the problem, in order to optimize the port of Curaçao. For example, a relatively simple solution is to renew the faulty crane, a solution that "only" requires an investment, according to the conclusion. Furthermore, the respondents suggest that the stevedoring company Curaçao Ports Services (CPS) - the company responsible for loading and unloading ships - must invest in its material so that the chassis capacity can be increased. A chassis is a special trailer or undercarriage that is used to transport sea containers by road. By means of such an investment the handling time of containers is shortened. The reason that the stevedoring company has not yet made such investments is that there is a lack of competition, according to the researchers. The Curaçao Ports Authority and the stevedoring company CPS reached a new agreement in 2016. According to that contract, CPS up to and including 2036 is responsible for optimizing the quality of the container port. Based on that agreement, the stevedore has to invest money in two new cranes. Furthermore, it has been agreed that more stevedoring companies may become active in the port in the near future. Competition problems regarding sea containers and transport appear to be more common in the Caribbean part of our Kingdom. For example, cargo transport between Curaçao and Bonaire is provided by Don Andres, which was established at the end of the eighties of the last century. The company is the only provider on the route mentioned. On request Don Andres also delivers the containers to the customer on the island.